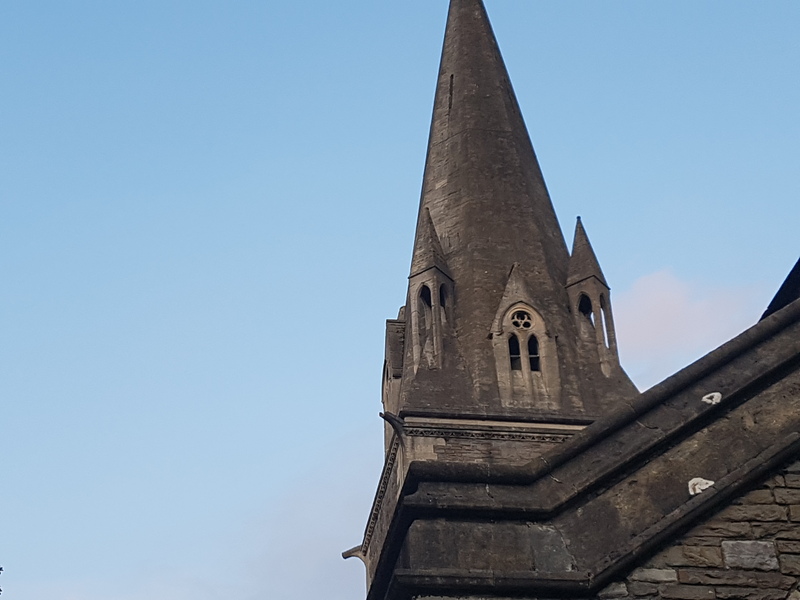 When I was growing up, as a teenager in the Canton area of Cardiff, St John’s church was a place where I used to hang around with my good friend Alex. Many hours were spent there discussing the merits of this piece of music or that, amongst many other things in their grounds. I never thought then that more than twenty years later I would be witnessing someone like Patti Smith perform in the very heart of this venue for the Festival of Voice in Cardiff. If truth be told I hardly ever saw anyone even enter the Church way back then. We queued for forty minutes waiting for Patti to soundcheck, but once inside, the 200 people in attendance sat in rapt awe as the high priestess of post-punk delivered a sermon of words and music for the ages, one that inspired, informed and ignited passions. The punk firebrand of yore is discarded this evening for tonight Patti Smith is a wispish guiding presence, shrouded in purple and blue light and framed by an impressive stained glass. Caustic, witty and warm, her words flow forth with her voice sounding brittle yet resounding as it grows into each word and lyric. It may be weathered yet is still quite remarkable even at the age of 71. 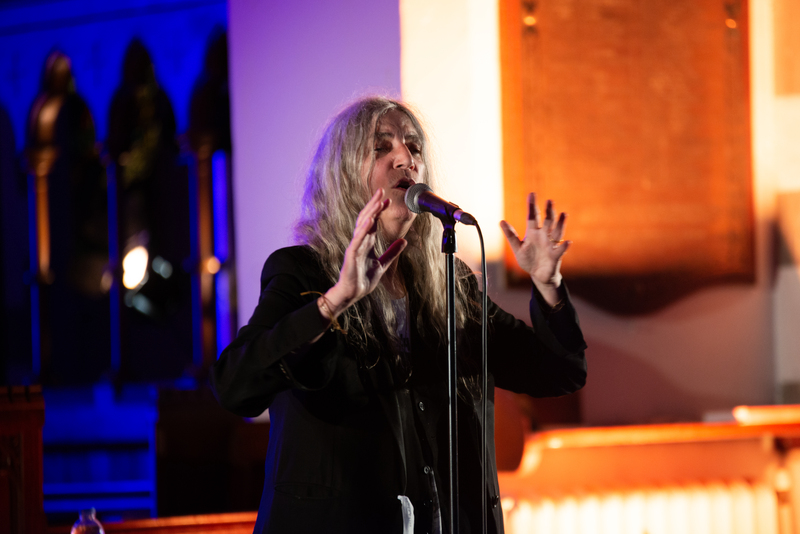 Serene, composed and wise, Patti Smith is positioned between her two long time collaborators Lenny Kaye on guitar and Tony Shanahan on guitar and keyboards, reading words from her new collection The New Jerusalem, interspersed with prose from 1971. As well as releasing a career-defining run of ’70s albums Horses, Easter and Wave , records that wrapped art rock, punk and prose around her unmistakable vision, Patti Smith emerged from a beat generation that included Allen Ginsberg. Smith is undoubtedly one of their number. Topical and poignant, the title poem ‘New Jerusalem’ is powerful and layered with history, culture, and thick with religious symbolism and a rebuke of the Trump regime. She calls Jerusalem the birth place of three religions not one and berates Trump’s recent decision to move the American embassy to that city in the only way she knows how, through verse. Now with acoustic guitar in hand, the chugging notes and mantras of ‘Ghost Dance’ – from her 1978 album Easter – are a tribute to North American tribes. Patti Smith talks of a period of self-doubt when writing, citing William Blake and Vincent Van Gogh whose artistic visions in life and death inspired her to continue to create: “in these times when fame and fortune are prized above all else, the important thing is to create something that adds to the canon, work that is important”. She reads a poem about the 50’s cop show Dragnet, that’s ominous theme tune had scared her as a kid, before performing a magnificent chiming version of ‘Dancing Barefoot’ – one of tonight’s undoubted highlights – with its closing refrain “Oh God I fell for you”. I am not religious but it takes on new levels of meaning given the venue. There’s a humanity on display too when she mentions the love of her life, her late partner Fred ‘Sonic’ Smith (former guitarist with the MC5) before lurching into a magisterial version of what is perhaps her most well known song, Bruce Springsteen‘s ‘Because the Night’. It is replete with sensitive pianos as Smith implores us “to take my hands” as she sings of touch, night time love, and with a gathering wave of haunting choruses it inspires a heart swelling sing-a-longs from the audience and ripples of applause. She finishes with a tender version of Elvis‘s “Can’t Help Falling in Love with You”, her hands parted as she delivers each note like a choir conductor; a stripped back set of words and music that is in perfect keeping with our surroundings. There’s a reverence to her words, a depth to her work and a wisdom to her voice. Patti Smith is that rare thing, a living legend and yet still a vital artist. As the applause from the 200 people gathered resounds around the church’s walls, I catch her shy smile realising that she’s as touched by the affection afforded to her tonight, as much as we are graced by being in the presence of greatness in such an unexpected environment. It is an evening that I will never forget.